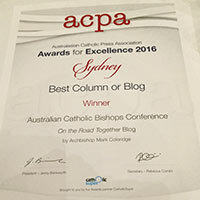 Archbishop Mark Coleridge’s daily blog during the Synod on the Family, ‘On the Road Together’ was awarded ‘Best Column or Blog’ at the Australian Catholic Press Association’s annual awards for excellent this year. 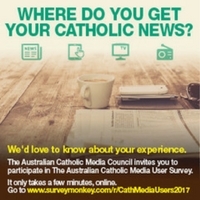 The judges acknowledged the daily personal insights into the Synod process, which the blog provided and highlighted the Archbishop’s ‘self-deprecating sense of humour’ throughout the blog posts. This entry was posted in Special interest and tagged Australian Catholic Press Association, Bishop Tony Randazzo, Catholic Media on September 14, 2016 by ACBC Communications.